Fifth in our set of Draft class Reviews for the 2016 season. First was the 2016 class, then the 2015 class then the 2014 class, then the 2013 class. The 2016 MLB.com Draft Tracker (which I believe is the best draft tracker out there) is the best place to get draft class information. This review is especially important to follow because the high-school age draftees in this 2012 class are Rule-5 eligible this coming off-season. Not that there’s that many of them, but we’ll put a pin in this post when we eventually do Rule-5 Analysis later this month. Round 1: (#16 overall) Lucas Giolito HS RH Starting pitcher: 6.75 ERA in 21 1/3 MLB innings, 6-5 with a 2.97 ERA mostly in AA but with 7 starts in AAA. 116/44 K/BB in 115 1/3 minor league innings. I feel, much like the 2016 presidential election, that most of us are girded in our opinions on Giolito at this point. I think Giolito’s entire season was tainted by the stories of mechanical tweaks done by some ne’er-do-weller in Viera, and his results on the field showed. He struggled with command and hit-ability during his brief time with the MLB team, and his velocity was down from where we were “expecting” it to be. Its important to remember that he just turned 22, that he lost a significant amount of development time because of his TJ surgery, and that we should be patient. But he definitely has a “todo list” for 2017. I’m projecting that he starts in AAA until he proves that he can command his fastball. Matriculated to Majors. Post-writing update: Giolito headlined a trade for Adam Eaton, heading to the White Sox. On his way out the door, word was leaked to multiple reporters that the Nats had “soured” on Giolito, questioning his toughness and his ceiling. Luckily for Giolito, the White Sox pitching coach (Don Cooper) is quite well regarded, so if there’s someone out there that can “fix” whatever’s wrong with him, its Cooper. I’ve updated the summary for his departure, which significantly thins this draft class. Round 2: (80) Tony Renda, Coll Jr 2B: Traded to the Yankees on 6/11/15 for David Carpenter. Renda then was included in the package that the Yankees sent to Cincinnati for Aroldis Chapman. For Cincinnati, Renda got 67 ABs this year and hit .183. Post-writing update: hat tip to commenter KW, Renda was outrighted to AAA earlier this month. He may have matriculated to the majors, but its safe to classify him as a AAA-ceiling player now. Round 3: (111) Brett Mooneyham, Coll Jr LH starting pitcher: Released him on 6/3/15. Round 4: (144) Brandon Miller Coll Sr Corner OF: Voluntarily retired on 7/10/15. Round 5: (174) Spencer Kieboom, Coll Jr C: Slashed .230/.324/.314 in 309 ABs for AA Harrisburg. 61/43 K/BB in 94 games splitting time behind the dish, 5 homers, 0 SB. Kieboom didn’t have the best numbers hitting in AA; he’s known for his defense. He became the final nats 40-man call-up when Wilson Ramos tore his ACL and got exactly one MLB at-bat (and thus permanently qualifying him for the MLB health plan for the rest of his days). He’s a catcher on the 40-man roster; he’s going to play in 2017. The question is where; right now depending on whether the team acquires another catcher, Pedro Severino may get pushed back to AAA, which may very well keep Kieboom in AA starting. Only makes sense. But if the team decides to keep Severino up, then Kieboom moves up too. Trending steady. Post-writing update: the team went and acquired Derek Norris, which now pushes Kieboom to 4th out of 4 on the depth chart, almost guaranteeing that he’ll be in AA again (you can’t have both Severino and Kieboom splitting time in AAA; that makes no sense). I don’t think this necessarily changes his projection, since Jose Lobaton hits so poorly, but he does have to climb over Severino if he wants to matriculate permanently. Round 6: (204) Hayden Jennings, HS OF/CF: Released in May 2014. Round 7: (234) Robert Benincasa, Coll Jr. RH relief pitcher: 1-1 with a 4.50 ERA in 21 appearances and 30 relief innings for AA. 35/14 K/BB in 30 IP, 1.50 whip, 4.69 fip, .329 babip for AA. Benincasa threw a few outings in Potomac but we’re just focusing on AA numbers here. He repeated AA for the third successive season and had good K/9 numbers but not much else in support. I’m guessing he sticks around for one more season, likely in the AAA bullpen, and plays out the 6-year string before hitting MLFA after next season. Unless he runs into a numbers game; there’s likely at least three 40-man roster guys that will get pushed to the AAA bullpen, limiting jobs for org-arms like Benincasa. He could be a release candidate before the full season squads break next spring. Trending down. Round 8: (264) Stephen Perez, Coll Jr. SS: Slashed .249/.351/.342 playing middle infield for Harrisburg. 59/47 K/BB in 301 ABs, 5 homers, 12SB. Perez was a Ben Zobrist-like player for AA, getting PT at all four infield positions plus left field. His slash figures were definitely an improvement over prior seasons, and may have stabilized his chances of moving up. All of the middle infielders for AAA this year are FAs (I believe) so there’s room for him to move up. I don’t view him as anything other than an org-guy though, and (like Benincasa above) seems likely to play out his contract and hit MLFA next season. Trending Steady. Round 9: (294) Derek Self, Coll Sr. RH relief pitcher: 4-2 with a 4.10 ERA mostly with AA Harrisburg. 43/18 K/BB in 52 2/3 innings, 1.48 whip, 3.98 whip, .333 babip. Self started the year briefly in Potomac’s bullpen but quickly returned to AA, where he spent most of the year. He got a 9/1 call-up to fill a bullpen spot in AAA. He improved his ERA over last year’s AA session and continues to hang on despite his lack of draft pedigree. I don’t see that he’s earned a promotion to AAA, and with a potentially packed AAA bullpen he may be back in AA again or to be a release candidate at this point. He turns 27 in January; I think the team knows what they have with him by this point. Trending down. Round 10: (324) Craig Manuel, Coll Sr C: Released 4/2/16 after (presumably) failing to win the backup catcher job at either Potomac or Harrisburg. Time ran out for the locak product (born in Rockville, MD). Round 11: (354) Brian Rauh, Coll Jr RH starter/reliever: Missed the entire 2016 season due to injury. Borrowing from last year’s analysis, if he’s healthy expect him to contend for the AA rotation in 2017. If he’s not healthy, he’s a release candidate at this point. Trending down. Round 12: (384) Carlos Lopez, Coll Sr 1B: Released on 6/30/15. Round 15: (474) Brandon Smith, OF: Didn’t sign. Attended Division II Grand Canyon University, where he played four years. He hit a robust .348/.402/.478 as a junior but wasn’t drafted, then slumped to hit just .233 his senior year. Again not drafted, might be done with baseball. Round 16: (504) Ronald Pena, Juco-2 RH starter/reliever: threw just 8 innings for Low-A Hagerstown before hitting the D/L in late April; he got another few innings in GCL rehab sessions but it was a lost season for Pena. I’d say he’s a release candidate unless the team likes something they see, but he’s now thrown just 18 innings in two seasons and the two A-ball full season squads seem pretty full. Trending Down. Round 17: (534) Blake Schwartz, Coll Sr RH Starting pitcher: Retired on 4/24/15. Round 20: (624) James Brooks, Coll SR SS/3B: Released May 2013. Round 21: (654) Austin Chubb, Coll Sr C: Released ahead of the 2015 season. Round 22: (684) Will Hudgins, Coll Sr RH reliever: Suddenly retired 7/12/13 per his Twitter account. Round 23: (714) Casey Selsor, Coll Sr LH Starter/Reliever: Released on 3/20/14. Round 25: (774) Freddy Avis, RHP: didn’t sign. Attending Stanford, where in 2013 he appeared in exactly one game and pitched 2 innings before suffering a season-ending injury. That injury never got better and he retired from baseball altogether in March of 2015. Round 26: (804) Skye Bolt, RHP: didn’t sign. Attended UNC, had an excellent college career and was a 4th round pick in 2015 by the Oakland A’s. Hit .231 for Oakland’s low-A team this year. Round 27: (834) Cody Poteet, RHP: didn’t sign. Attended UCLA and got drafted (like Bolt) in the 4th round of the 2015 draft by the Marlins. Was 4-9 with a 2.91 ERA starting in the Sally league this year. Round 28: (864) Hunter Bailey, Coll Sr SS/2B: Released May 2013. Round 29: (894) Leonard “LJ” Hollins, Juco RH reliever: Released 7/2/14. Round 30: (924) Robert “R.C.” Orlan Coll Jr LH Starter: 5-6 with a 3.93 ERA relieving and sometimes closing for High-A Potomac. 46/46 K/BB ratio in 52 2/3 innings (no, that wasn’t a typo). 1.61 whip, 5.16 fip, .250 babip. I’m not quite sure what happened to Orlan’s control, since it looked just fine in 2015 (85/28 K/BB ratio in 72 relief IP). The Virginia product (UNC by way of Deep Run HS in Glen Allen, VA) definitely needs to get his walks under control to keep moving up, but is a potential lefty reliever in a system that could use one. I’ll say Trending Steady and project him for the AA bullpen. Round 31: (954) Michael Boyden Coll Sr RH reliever: Released Jan 2014. Round 32: (984) Michael Mudron, Coll Sr LH reliever: Released Jan 2014. Round 33: (1014) Mike McQuillan, Coll Sr 2B/3B: Released 3/26/15. Round 34: Jake Jefferies, 2B: didn’t sign. Attended Cal State Fullerton and subsequently drafted again by the Nats in the 39th round in 2015. As we found out in our 2015 post, he was released in July 2016. Round 35: Corey Bafidis, LHP: didn’t sign but Washington picked him in 2013. As we learned in the 2013 post, he got released in July 2014. Round 36: Max Ungar, C: didn’t sign. Went to the Charles E Smith Jewish Day school in Bethesda and attended Division III Denison, where he did seem to ever play. A quick google search found him on linkedin; he graduated in 2016 and now works in the DC area. I’ll venture a guess that this was a “favor pick” to someone with ties to the organization. Round 37: Tyler Watson, LHP: didn’t sign. Attended Kansas U for a year, then bounced to McLennan Community College in Waco, TX and and got drafted by the Angels in the 38th round of the 2014 draft. He had a 3.42 ERA for the Angels’ low-A squad in 2016. This is *not* the same Tyler Watson, by the way, that the Nats drafted in the 2015 draft. Round 38: Jarred Messer, RHP: didn’t sign. Graduate from Malone college and has pitched the last three years with the Kansas City T-Bones in the independent American Association, going 4-5 in 2016. Round 39: Mitchell Williams, C: didn’t sign. Attended the Marion Military Institute in Alabama, for which I cannot find any stats. Round 40: Ricky Gutierrez, CF: didn’t sign. Presumably playing football for U-Conn, as per the Draft Tracker. We have speculated that this would be a one-player draft, and we’re getting closer to that reality. Only Giolito is “succeeding” right now, and there’s rather fierce debate about his “ceiling.” Renda technically has matriculated to the majors as well, but his .183 BA there isn’t exactly all-star calibre (and he was just outrighted, meaning he may be downgraded to “peak before majors” in future versions of this post). Kieboom is on the 40-man roster but is 3rd out of 3 4th out of 4 on the Nats Catcher depth chart and may not even play in AAA next year. The only other two guys remaining from this draft class even projected to be trending steady are both clearly org-guys who are playing out the string (Perez, Orlan). Of the 8 remaining players from this draft, Giolito is on the 40-man and no one else merited any discussion for Rule 5 protection this coming December. If there was some complaint about the 2013 draft class … then how do you feel about this one? I remember arguing in this space about whether a one-man draft could be a success if that one player was a perennial all-star (as Giolito projected to be for a while) and there was differing opinions on the subject. Well, now that there’s questions about what Giolito will eventually be, now how do you feel about this draft class? The next in a series: previously we reviewed the 2015 season stats for the 2015 draft class, 2014 draft class, and the 2013 draft class. Like with the 2013 post, this one was easier to do thanks to having done the 2012 guys back in 2013 time-frame. Is it worth going back one or two more draft classes at this point? Maybe not; the 2012 draft class has mostly already been Rule-5 exposed, a good benchmark for prospects to make it or break it in terms of advancement or resignation as “org guy.” I have gone back one more class to 2011 and that’s it, so one more in this series after this. Baseball-reference.com’s draft database for Nats 2011 class. My working XLS in Google for all this data (cut-n-pasted at the bottom). TheBaseballCube.com for really obscure stats for players, like college stats for these upper round 30s guys. Round 1: (#16 overall) Lucas Giolito HS RH Starting pitcher: 7-7, 3.15 ERA across two levels, starting at HighA and moved up to AA. 131/37 K/BB in 117 IP (21 “starts”) with 1.96/3.18 fip, and .352/.341 babip splits between HighA/AA. A fantastic season for the newly-turned 21-yr old, who dominated HighA before moving up and holding his own in AA for the last two months of the season. All the pre-season talk about how he was going to have “no innings limits” was bunk; he was kept in XST until the first week of May and routinely skipped starts so as to extend him through the whole season while keeping his innings year-over-year increase just below the magical 20% mark (98 IP in 2014, 117 in 2015). He’s now routinely named as either the best or the 2nd best (behind LA’s Julio Urias) pitching prospect in all of baseball. Not much else to say. I’m guessing he starts 2016 in AA, moves to AAA and may even get tapped once he surpasses the Super-2 deadline as an injury fill-in starter in the majors. Look for him to get about 140 innings in 2016 all told (that’s 20% bump from his 2015 117 total). Trending Up. Round 2: (80) Tony Renda, Coll Jr 2B: .267/.333/.340 in Harrisburg with 15/19 K/BB ratio and 13 SBs in a little less than a half a season in AA before he was traded to the Yankees on 6/11/15 for David Carpenter. Renda had progressed nicely in the system as a defense and speed-first second baseman, but in the immediate seems like he was blocked by Wilmer Difo, perhaps the rising of Chris Bostick and the presence in the majors of three or four different guys who can play an adequate second base. So the team flipped him for something they needed; reliever depth. Round 3: (111) Brett Mooneyham, Coll Jr LH starting pitcher: was 0-2 with a 6.41 ERA in 19 ineffective innings for LowA Hagerstown before the Nats finally cut the cord and released him on 6/3/15. Mooneyham was in Low-A for the third successive season, having failed to make the cut in Potomac in each of 2013 and 2014. You’d have to say that he’s one of the more higher-profile drafting failures of the Mike Rizzo era. 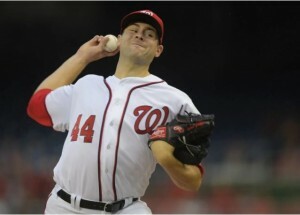 Or maybe not; the team had to go over-slot to sign Giolito and may have skimped for the rest of the draft. Round 4: (144) Brandon Miller Coll Sr Corner OF: .226/.301/.421 in 59 games with Potomac before voluntarily retiring on 7/10/15. Despite showing some power (he hit 20 homers in the 2013 season), he never really solved HighA and made way in the Potomac outfield for some rising DSL grads. Round 5: (174) Spencer Kieboom, Coll Jr C: Slashed .248/.344/.346 with 30/36 K/BB in 246 ABs with Potomac, which were incremental steps back from his great low-A numbers in 2014. He missed a good portion of the season with injury (concussion) and is currently playing in the Arizona Fall League to make up for it. He was starting to get some notice in the organization, appearing in the tail end of top-30 prospect lists. Despite his step back in offense, Kieboom has taken a huge step forward in terms of his defense, his play-calling and pitch-framing. Scouting reports on him are glowing in this regard, with most projecting him at worst as a backup catcher in the bigs because of his defensive capability. I think he starts 2016 in AA with an eye towards getting his bat back on track, and if he keeps producing he could soon be a viable alternative to the current catching tandem in the majors. Trending up. Round 6: (204) Hayden Jennings, HS OF/CF: Released in May 2014 after two years in the GCL with big K numbers. Round 7: (234) Robert Benincasa, Coll Jr. RH relief pitcher: Just 4 IP for Harrisburg this year until suffering a season-ending injury. He made the AA bullpen out of spring (which is where he ended the 2014 season) and seemed to be in a decent spot but got almost no playing time. Minor league relievers generally don’t get a lot of love from prospect hounds, but in a system where an able-bodied RHP who could throw strikes would have been nice to have in August and September, there’s still opportunity for Benincasa going forward. Trending Steady if he’s healthy, looking at a ST2016 release if not. Round 8: (264) Stephen Perez, Coll Jr. SS: slashed just .209/.302/.280 with 87/59 K/BB in 435 ABs between Potomac and Harrisburg. 2 homers, 16 steals. Perez broke camp with Harrisburg but couldn’t cut it, hitting just .130 in April before getting dumped back to repeat High-A. In 1300+ career minor league ABs he’s now hitting just .233 and doesn’t seem like he’s long for the organization. As mentioned in this space before, the Nats drafted a ton of college middle infielders in 2015 and Perez may struggle to keep his slot given what’s expected to rise up. Trending down. 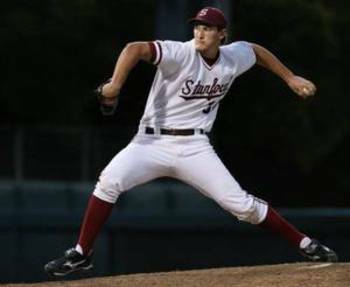 Round 9: (294) Derek Self, Coll Sr. RH relief pitcher: 4-5, 3.56 ERA with 45/15 K/BB in 60ip. 3.71 fip, .291 BABIP in Potomac. Broke camp as a member of the AA bullpen but got hit and was dumped back to high-A, where he spent most of the season. This is the third straight year he’s been in Potomac as a college senior draftee; odds are there won’t be a 4th. He may break camp with a full season squad in 2016 but may fall victim to a numbers game once the short-season guys start pushing for promotions. Trending down. Round 10: (324) Craig Manuel, Coll Sr C: slashed just .206/.276/.242 between three levels but mostly with Potomac. He had just 165 ABs on the year as he served as the backup catcher in High-A. Its his third straight season of essentially being an “old for the level” backup catcher who has struggled to hit the Mendoza Line since leaving Low-A. Its hard to read the tea-leaves on catchers since they’re so scarce, so I won’t summarily pass judgement that Manuel’s time is about to come to an end. He could very well be the backup catcher again in Potomac next year. He is a local guy (born in Rockville, MD though he went to HS in Florida and college in Texas), so perhaps he enjoys playing in the DC area. Otherwise, just based on his offensive numbers I have to say he’s Trending Down. Round 11: (354) Brian Rauh, Coll Jr RH starter/reliever: 4-7, 3.39 ERA with 84/24 K/BB ratio in 101 innings (18 starts) across *four* different levels. 2.61/4.95 fip in Potomac/Harrisburg where he spent the most time this year. Rauh had a nice tour of the system this year, starting in High-A (he was the #2 opening day starter), getting hurt, doing some rehab in the GCL, then working his way back up the chain from Low-A to High-A to AA. He ended the year in Harrisburg’s rotation, for what its worth. He didn’t entirely impress at AA but had an incrementally better season in High-A. My guess is that he starts the 2016 season in the AA rotation, but he has to show he’s worthy in AA. Trending Steady. Round 12: (384) Carlos Lopez, Coll Sr 1B: Slashed just .138/.265/.241 in 10 games in Hagerstown before being released on 6/30/15. This was the third straight season that Lopez featured in Hagerstown, having spent the first two months of the season in XST after getting beat out for the 1B job in the spring. Eventually there just was no more room for Lopez, with uber prospect Jose Marmolejos-Diaz soon taking over at 1B in Hagerstown and slugging 11 homers in a half-season. Round 13: (414) Elliott Waterman, Coll Jr LH reliever: Struggled in two Short-A stints and was released on 3/15/14 prior to the beginning of the 2014 season when he couldn’t break into a full-season bullpen. Round 14: (444) Jordan Poole, Juco-2 corner OF: Similarly to Waterman above, Poole struggled to hit in two seasons shuttling between Short-A and GCL, and the Nats released him on 3/14/14 when he wasn’t set to make a full season roster. Round 15: (474) Brandon Smith, OF: Didn’t sign. Attending Division II Grand Canyon University, where he remains today. He hit a robust .348/.402/.478 for them this season but was not drafted as a draft-eligible junior. Maybe the Nats take a flier on him in a late round since they love doing re-drafts on late-round HS picks. Round 16: (504) Ronald Pena, Juco-2 RH starter/reliever: threw just four rehab innings in 2015, spending the entire season on the Potomac Disabled List. He was coming off a season where he had a 5.96 ERA in High-A and needed 2015 to show he could make the jump. My guess is that he’ll get another shot at being the Potomac swing-man in 2016 but he may struggle to make the squad, given the huge number of college arms pushing into the system year after year. Trending Down. Round 17: (534) Blake Schwartz, Coll Sr RH Starting pitcher: 0-2, 5.87 ERA in 3 Potomac starts and then he called it quits, officially retiring on 4/24/15. Schwartz was *so good* in 2013 for Potomac (11-4, 2.65 ERA) then struggled in AA before getting hurt in 2014 and missing half the season. I thought the retirement was surprising; maybe his 2014 injury just killed his arm and with it his career. Too bad; he was looking like a fantastic low-round find. Round 18: (564) David Fischer, Coll Sr RH reliever: Released on 7/3/14 after bouncing around the system for a couple of years. Round 19: (594) Bryan Lippincott, Coll Sr 1B: Retired ahead of the 2014 season after one decent season in Short-A. Round 20: (624) James Brooks, Coll SR SS/3B: Released May 2013; he was a senior sign who played last season mostly in the GCL, save for a 2 week stretch where he went 1-32 in Short-A. Round 21: (654) Austin Chubb, Coll Sr C: Released ahead of the 2015 season after struggling to a .221/.299/.324 line in Hagerstown in 2014. Signed as a MLFA with Los Angeles and bounced around their farm system this year, missing huge chunks of the season with injury. Backup Catchers can live forever. Round 23: (714) Casey Selsor, Coll Sr LH Starter/Reliever: Posted a 4.29 ERA in ShortA in 2014, then released on 3/20/14. Round 25: (774) Freddy Avis, RHP: didn’t sign. Attending Stanford, where in 2013 he appeared in exactly one game and pitched 2 innings before suffering a season-ending injury. That injury never got better and he retired from baseball altogether in March of 2015. Shame. Round 26: (804) Skye Bolt, RHP: didn’t sign. Attended UNC, had an excellent college career and was a 4th round pick in 2015 by the Oakland A’s. He kind of reminds me of our 2015 pick Andrew Stevenson frankly; kind of an odd swing, defense-first speedy outfielder with limited power. Round 27: (834) Cody Poteet, RHP: didn’t sign. Attended UCLA and got drafted (like Bolt) in the 4th round of the 2015 draft by the Marlins. Round 29: (894) Leonard “LJ” Hollins, Juco RH reliever: released 7/2/14 after struggling for half a season in Hagerstown. Round 30: (924) Robert Orlan Coll Jr LH Starter: 3-1, 3.00 ERA with 85/28 K/BB ratio in 72 relief IP between LowA and HighA. Orlan bounced between Potomac and Hagerstown all season, ending up in HighA with pretty good numbers in a “more than a loogy” role. Especially impressive is 85 Ks in just 72 ip. He’s older for these levels, inarguably, but could put himself in a good position by continuing to succeed in 2016. I see him in the Potomac bullpen again with an eye towards a June promotion to AA when the short-season promotions come due. Trending Steady. Round 31: (954) Michael Boyden Coll Sr RH reliever: Released Jan 2014 after struggling for two years in Rookie ball as a college senior sign. Round 32: (984) Michael Mudron, Coll Sr LH reliever: Released Jan 2014 after posting a 6.82 ERA in Short-A in 2013. Round 33: (1014) Mike McQuillan, Coll Sr 2B/3B: Released 3/26/15 after hitting just .207 in Potomac last year, likely losing out on a numbers game. Round 34: Jake Jefferies, 2B: didn’t sign. Attended Cal State Fullerton and subsequently drafted again by the Nats in the 39th round in 2015. Round 35: Corey Bafidis, LHP: didn’t sign but Washington picked him in 2013. Round 36: Max Ungar, C: didn’t sign. Attending Division III Denison, where he did not seem to even be playing. Round 37: Tyler Watson, LHP: didn’t sign. Attended Kansas U for a year, then bounced to McLennan Community College in Waco, TX and and got drafted by the Angels in the 38th round of the 2014 draft. This is *not* the same Tyler Watson, by the way, that the Nats drafted in the 2015 draft. Round 39: Mitchell Williams, C: didn’t sign. Attended the Marion Military Institute in Alabama, for which I cannot find any current stats. Three years onward, there’s just 10 of the 40 names left active somewhere in the minors. 11 never signed and another 19 have been released or retired. We cashed in Renda on a middle reliever who subsequently got hurt, and this class has one of the best 2 or 3 prospects in the game. Otherwise … there’s just not much there. It seems likely that the Nats 2012 class is going to end up producing just two MLB players; a near Ace and possibly a backup Catcher. Maybe one of the trending steady middle relievers can make a run ala Aaron Barrett. Otherwise, is this class a disappointment? I recently did a John Sickels style review of all our 2013 draft picks. And I thought it’d be fun to do the same for our 2012 draft class one year in (see here for the 2012 version of the post). Lets check in to see how these guys are doing in their 2nd pro seasons. As always; the Big Board and the Draft Tracker are the two best Nats prospect resources out there. Thanks SpringfieldFan for doing all that you do. Stats are pulled from milb.com and fangraphs.com and are current as of the end of the regular minor league seasons. Finally, at the end of each writeup i’ll put in a color coded trending line (my own opinion) for the player: Green for Trending Up, Blue for Trending steady, red for Trending Down. Round 1: (#16 overall) Lucas Giolito HS RH Starting pitcher: 2-1, 1.94 ERA with 39/14 k/bb in 36 2/3 innings, 28 hits mostly in the GCL. All Nats prospect fans should know of Giolito’s status these days; he has come back from surgery, pitched effectively in the rookie league and was lights out in 3 starts in short-A (one run conceded in 14 innings). Per comments and scouting reports his velocity is back, he seems healthy, and he could be just a season away from being breathlessly talked about as one of the best prospects in the game. Should feature in full-season ball (likely starting in low-A with an eye for finishing in high-A) in 2014. Trending Up. Round 2: (80) Tony Renda, Coll Jr 2B: .294/.380/.405 with 3 homers, 68 walks, 65 Ks in 521 ABs at Hagerstown. Also was 30 for 36 on the basepaths. Those are solid full season numbers. I like that Renda makes a lot of contact; a K rate of just 12% on the year isn’t too bad. Renda was a young college draftee (he turned 22 in January of this year), so he isn’t necessarily “too old” for Hagerstown. He will continue to move up the food chain in 2014. Trending Up. Round 3: (111) Brett Mooneyham, Coll Jr LH starting pitcher: 10-6, 3.19 ERA with 85/54 k/bb in 104 1/3 innings, 67 hits mostly for Hagerstown. I was worried when Mooneyham couldn’t break the high-A roster, given his age and draft day pedigree. He started out strong, endured a D/L stint, then dominated towards the end of the season, forcing a promotion. In high-A? Not so great; he had three awful starts to close out the season. Mooneyham continues to “look” like a better pitcher than his numbers; he’s too wild, he doesn’t miss as many bats as you like, but he gets the job done (well, in low-A anyway). Clearly he’s going to be in the Potomac Rotation for 2014; lets see how he does. But i’m beginning to question his true “ceiling” in this organization; is he going to top out like a Danny Rosenbaum, a mediocre AAA starter? Trending Steady. Round 4: (144) Brandon Miller Coll Sr Corner OF: .255/.317/.457 with 20 homers, 41 walks, 164 strikeouts in 505 at bats splite between Hagerstown and Potomac. His statline seemed to feature as a power hitting corner outfielder in Hagerstown: 18 homers in 103 games, a homer every 22 at-bats or so. But then in Potomac he’s hit .300 with a .350 OBP and just two homers in 110 at-bats. It could be a case of being slightly old for low-A: he turns 24 in a month’s time. Either way, he really needs to cut down on the K’s; 164/505 equates with nearly a 33% strike-out rate. That’s going to catch up to him unless he starts hitting 40 homers instead of 20. Otherwise, he’s done nothing to jeopardize his continued rise up the system for 2014. Trending Steady. Round 5: (174) Spencer Kieboom, Coll Jr C: 6 at-bats in 4 games for the GCL Nats in late August; a lost season for Kieboom due to Tommy John surgery undergone in early 2013. Since he’s not a pitcher, he returned to the field in less than a year’s time. But he’s lost a year of development and now will compete with 2012 draftee catchers such as Geoff Parrott and rising DSL grads like Pedro Severino for playing time in the full-season A-ball teams in 2014. Trending Down. Round 6: (204) Hayden Jennings, HS OF/CF: .248/.313/.343 with 0 homers, 11 walks, 48 Ks in 137 at-bats while repeating the GCL in 2013. Jennings struggled in his rookie league pro debut in 2012 and repeated the level, improving his OPS nearly 200 points. He has improve upon a horrible strikeout rate but still is striking out 35% of the time. That’s really not a good sign for the leadoff/CF guy he seems to project as right now; he needs to show a much higher OBP, put more balls in play, and do more on the basepaths (12 SBs in 44 games). I think he gets moved up for 2014, but may really struggle in full-season ball. Trending down. Round 7: (234) Robert Benincasa, Coll Jr. RH relief pitcher: 0-5 with 27 saves, 3.00 ERA with 64/14 K/BB in 51 IP, 45 hits split between Hagerstown and Potomac. Benincasa has settled into a closer role, getting 10 saves for Hagerstown to open the season before earning a promotion to Potomac about halfway through the season and continuing as their closer. His K/BB rate stayed high even with the promotion, though his ERA and hits/9 crept up a bit. He seems set to move up to Harrisburg and could compete with Richie Mirowski for the AA closer role in 2014. Trending up. Round 8: (264) Stephen Perez, Coll Jr. SS: .248/.303/.326 with 4 homers, 11 walks, 40 Ks in 107 at-bats in low-A Hagerstown. Wow; 107 strikeouts in 432 at-bats; 25%. You just can’t have a 25% strikeout rate for a weak hitting, no power middle infielder. These numbers were in line with his short-season numbers too. He’s a college junior draftee from a very good baseball school (U of Miami) in low-A who looks like a draft bust right now. Trending down. Round 9: (294) Derek Self, Coll Sr. RH relief pitcher: 4-5 with 8 saves, 4.66 ERA with 49/16 K/BB in 56 IP, 64 hits split between Hagerstown and Potomac. Self started in Potomac, had a 6.29 ERA in 23 apperances and was demoted mid-season to Hagerstown. In low-A he had more respectable numbers but nothing eye-popping. He was a low-bonus college senior draftee who’s struggling to make a mark in a league where he’s one of the older guys out there. I could see him being a post-2014 spring training cut. Trending down. Round 10: (324) Craig Manuel, Coll Sr C: .282/.364/.347 with 1 homer, 24 walks, 20 Ks in 170 at-bats mostly in low-A Hagerstown. He missed a month mid-season, then was mostly the backup to Adrian Nieto in Hagerstown. Unfortunately, a low-bonus college senior draftee who’s backing up guys in low-A probably isn’t long for the organization. He may be a victim of the catcher numbers game at some point (though, that being said, the team only drafted one catcher in 2013; maybe he sticks around for a while). Trending down. Round 11: (354) Brian Rauh, Coll Jr RH starter/reliever: 7-4, 4.50 ERA with 68/34 K/BB in 106 IP, 107 hits split between Hagerstown and Potomac. An odd season for Rauh; he struggled in middle relief in low-A (posting a 5.21 ERA), then was promoted to Potomac, where he was installed as a starter. He had 12 mostly mediocre starts (4.22 ERA) before being moved to the bullpen the last week of the season when Brett Mooneyham was promoted up. Is he a starter? Is he a reliever? More time in the system is apparently needed; i’m guessing he begins in the bullpen in high-A next year. Trending Steady. Round 12: (384) Carlos Lopez, Coll Sr 1B: .296/.441/.407 with 0 homers, 7 walks, 7 Ks in 27 at-bats in low-A Hagerstown. Lopez went on the 7-day DL in mid-April after just 9 games and never came off. I cannot find word of his injury. But with newly drafted James Yezzo in the mix as a 1B-only draftee, Lopez has his work cut out for himself to retain his standing in the organization. Especially considering that he was a College senior sign who is positionally limited and hasn’t shown much in the way of power at the professional level. Trending down. Round 13: (414) Elliott Waterman, Coll Jr LH reliever: 2-0, 2.96 ERA with 13/12 K/BB in 24 1/3 IP split between the two short season teams. Waterman performed poorly in Short-A last year, did not make a full-season team out of camp, then got hammered again in his early outings for Auburn this year before getting demoted to rookie ball. He pitched better in the GCL, eventually earning a call-back to Auburn but has not appeared since 8/31/13. He’s still relatively young (does not turn 23 until November) and he’s a big tall lefty, but he’s putting too many guys on base and not getting enough swing and miss stuff to stick as a situational arm. He may get one more spring training but it wouldn’t surprise me to see him cut loose if he doesn’t make a full-season team in 2014. Trending down. Round 14: (444) Jordan Poole, Juco-2 corner OF: .222/.278/.403 with 3 homers, 6 walks, 40 Ks in 72 at-bats split between the two short season teams. I’ll repeat this metric: 40 Ks in 72 at-bats. He struggled in Auburn and then got hurt in late July, missing 3 weeks. He finished the season in Rookie ball, probably a combination rehab assignment/demotion. He does feature some pop; his isolated slugging of .441 in Auburn shows some promise. But that’s a lot of strikeouts. He’s still very young (he turned 22 just this week) so he will continue in the system. Trending down. Round 15: (474) Brandon Smith, OF: Didn’t sign. Hit .318/.370/.406 as a freshman corner outfielder at Division II Grand Canyon University. Round 16: (504) Ronald Pena, Juco-2 RH starter/reliever: 4-3, 3.48 ERA with 55/34 K/BB in 88 IP for Hagerstown. Pena started the season in the Hagerstown rotation, where he stayed mostly until the end of May. He had a 4.70 ERA as a starter on the season; not good enough given the arms matriculating upwards. From there he worked the bullpen, where in the same number of innings his Ks were up, his walks down and his hits allowed down. It seems to me he’s bullpen-bound from here. Trending Steady. Round 17: (534) Blake Schwartz, Coll Sr RH Starting pitcher: 13-4, 2.51 ERA with 101/28 in 147 IP for Hagerstown and Potomac. Schwartz started the year in the Hagerstown rotation and ended it in Potomac, getting the ball for their 2nd playoff game. After striking out 21 guys in his first 14 low-A innings, he was quickly promoted up and threw 132 additional innings in Potomac. His ERA was low upon promotion, he fared equally well against lefties and righties. I’d like to see more K’s, but it is hard to argue with the results. He had to be in the “player of the year” discussions for the organization. So far looking like a great find this late in the draft from a small school. Trending up. Round 18: (564) David Fischer, Coll Sr RH reliever: 5-0, 4.06 era with 81/52 K/BB in 58 IP for Hagerstown and Potomac. He got a quick bump up from Hagerstown after just 9 apperances and spent the bulk of the season in Potomac’s bullpen providing longer relief stints every few days. He hit the D/L in mid August and never came back off of it. This beanpole (6’5″ 175lbs) clearly has some strikeout type stuff (53 Ks in his 44 high-A innings) but he is also wild as hell (44 walks in 44 innings to go with 8 wild pitches and 5 HBPs in high-A). It sounds like someone needs to coach Nuke LaLoosh up here. Trending Steady. Round 19: (594) Bryan Lippincott, Coll Sr 1B: .273/.346/.434 with 7 homers, 25 walks, 39 Ks in 198 at-bats split between Auburn and Hagerstown. A small-college senior signee, Lippincott spent all of 2012 in the GCL (where he clearly was “old for the level.”). In 2013, he waited for short-season to start, then slugged .464 in 44 games for Auburn before getting the call-up to Hagerstown to play for the team during the playoffs. He struggled in 10 playoff games (understandible; they’re the best teams in the league) but otherwise had a nice season. He’s seemingly set to compete for perhaps the 1B or DH in High-A for 2014. Trending Steady. Round 20: (624) James Brooks, Coll SR SS/3B: Released May 2013; he was a senior sign who played last season mostly in the GCL, save for a 2 week stretch where he went 1-32 in Short-A. Apparently he didn’t make a team out of spring training and was released just before Short seasons started. 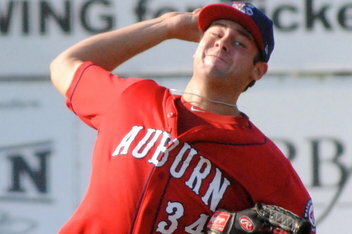 Round 21: (654) Austin Chubb, Coll Sr C: .200/.241/.238 with 0 homers, 2 walks, 12 Ks in 105 at-bats for Auburn. Chubb was a part-time catcher, splitting time with others in Auburn, and followed up his generally poor 2012 GCL numbers with even worse numbers in 2013. He had just two walks in 100+ plate appearances? With no power to show for it? Chubb may not be long for the organization, despite the positional scarcity. Trending Down. Round 22: (684) Will Hudgins, Coll Sr RH reliever: 3-2, 4.41 ERA with 28/21 K/BB in 32 2/3 innings, 25 hits split between low- and short-A. Suddenly retired July 12th on Twitter. Round 23: (714) Casey Selsor, Coll Sr LH Starter/Reliever: 0-6, 4.29 ERA with 30/14 in 42 1/3 innings, 56 hits for Auburn. Selsor was drafted with 2-way capabilities but has only pitched for the Nats. He started the season in Auburn’s rotation, got demoted to the bullpen after 6 starts, but eventually made his way back into the rotation in some sense by the time the season was over. He gave up a ton of baserunners, but his babip was high. Despite a 4.29 ERA his FIP for the year was just 3.15. So he pitched better than his stats look. Trending Steady. 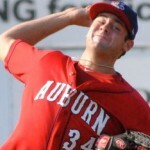 Round 24: (744) Kevin Dicharry, Coll SR RH pitcher: 0-2, 14.54 ERA with 4/2 K/BB in 4 1/3 innings, 8 hits for Auburn. Dicharry pitched very poorly in his first three Auburn appearances and then was released 7/1/13. Without any knowledge of how well he recovered from the arm issues he had in college, this seems like an incredibly quick release considering how well he pitched (even if he was overaged) last year in the GCL. Round 25: (774) Freddy Avis, RHP: didn’t sign. Attending Stanford, where in 2013 he appeared in exactly one game and pitched 2 innings before suffering a season-ending injury. Google research is spotty, but it seems like he aggravated the same knee which he had ACL surgery on in 2012 and which ended his HS career prematurely. Round 26: (804) Skye Bolt, RHP: didn’t sign. Attending UNC, where in 2013 he hit .349/.449/.550 as a freshman starter for one of the best teams in the nation. That’s a pretty darn impressive slash line for a freshman in the ACC. Those are 1st round pick numbers. Round 27: (834) Cody Poteet, RHP: didn’t sign. Attending UCLA, where in 2013 as a mid-week starter/weekend reliever he was 4-6, 4.84 ERA with 56/31 K/BB in 70+ innings for the CWS champions. We don’t have advanced stats, but his BAA of .227 seems to indicate his ERA was incredibly unlucky. He should be a weekend starter for UCLA next season. Round 28: (864) Hunter Bailey, Coll Sr SS/2B: .182/.265/.205 with 0 homers, 4 walks, 11 Ks in 44 low-A at bats earlier this season. Bailey was released May 2013. The jump from GCL to full-season ball proved too much for Bailey and he was cut loose as an expendible backup middle-infielder in a system full of them rising quickly up the ranks. Round 29: (894) Leonard Hollins, Juco RH reliever: 1-4, 2.91 ERA with 36/16 in 46 1/3 innings, 48 hits mostly for Auburn. The submariner made a successful jump to short-A out of the GCL, and still has not given up a professional home-run. All we have to do now is figure out if he’s “Leonard” or if he’s “L.J.” since milb.com and Fangraphs differ in their names for him. Trending Up. Round 30: (924) Robert Orlan Coll Jr LH Starter: 1-5, 3.65 ERA with 47/22 K/BB in 56 2/3 innings, 54 hits for Auburn. Orlan was the leading innings-eater for Auburn in 2013 after missing the whole 2012 season following TJ surgery. Orlan kept the ball down, pitched better than his ERA shows (3.38 fip) and shows no reason not to continue up the chain and compete for rotation jobs in full season ball next year. As I said last year, he could be a great sleeper pick. Trending Up. Round 31: (954) Michael Boyden Coll Sr RH reliever: 0-0, 4.61 ERA with 15/14 K/BB in 13 2/3 innings, 17 hits for GCL. 14 walks and 17 hits equates with a balloned 2.27 whip for this 23-year old in the rookie league (which means he’s likely throwing against guys 4-5 years younger than he is). It is hard to understand why he was back in the GCL after having shown he could handle Short-A last year. Either way, his control issues from last year caught up with him in 2013 and I don’t think he’ll be long for the organization. Trending Down. Round 32: (984) Michael Mudron, Coll Sr LH reliever: 1-3, 6.82 ERA with 32/15 K/BB in 30 1/3 innings, 43 hits. Great K/9 rates for a matchup lefty (reminder: milb.com lists him as a RHP when he’s actually a lefty). His game-logs show what a weird season he had: of the 23 earned runs he gave up in his 30 innings, 20 of them came in four awful outings, highlighted by his 8/24/13 outing: he gave up 5 hits and 5 walks in an inning and a third, resulting in 6 earned runs. These factors contributed to his FIP being just 2.77, a huge delta from his ugly ERA. I’d imagine this stat line makes it hard for higher-ups to evaluate him. Nonetheless, he should feature in a full-season bullpen in 2014. Trending Steady. Round 33: (1014) Mike McQuillan, Coll Sr 2B/3B: .277/.372/.367 with 2 homers, 40 walks, 66 K’s in 264 low-A at-bats (skipping 5 rehab games he did in the GCL). As with last year, good average and great OBP, but little to no pop. He missed 2 full months of the season with an injury that I cannot easily google. Otherwise he continues to profile as an undersized, speedy 2nd baseman with good OBP capabilities. He’ll move up to Potomac in 2014. Trending Steady. Round 34: Jake Jeffries, 2B: didn’t sign. Attending Cal State Fullerton, where in 2013 he hit .260/.327/.360 as a starting middle infielder. Round 35: Corey Bafidis, LHP: didn’t sign but Washington picked him in 2013. From the 2013 version of this post: Coll Sr LH relief pitcher. 2-0, 2.73 ERA with 22/13 K/BB in 26 1/3 relief innings mostly in Auburn, 18 hits. He got pushed to low-A too early, settled into short-A where he probably belonged to begin with, and pitched relatively well for 20 innings. Too many walks for a relief pitcher, though, he’ll have to work on that. He mostly worked in 2 inning stints and never got any looks at starting. Trending steady. Round 36: Max Ungar, C: didn’t sign. Attending Division III Denison, where he does not appear to be playing baseball at all. Seems to have quit the sport. Was th is a “favor draft pick” to give someone’s friend’s kid some notariety? Round 37: Tyler Watson, LHP: didn’t sign. Threw just 3 2/3 innings over 6 games for Kansas U as a freshman. Round 38: Jarred Messer, RHP: didn’t sign. Finished 6-4 with a 2.70 ERA his senior year at Malone University but then went undrafted, and as far as I can tell did not get picked up by either a MLB org or an independent league team. He seems to be playing in the Ohio Tuscarawas County Class A league, an Adult baseball amateur league. Round 40: Ricky Gutierrez, CF: didn’t sign. Presumably playing football for U-Conn, as per the Draft Tracker. I could not find any individual football stats for him in rudimentary googling. Summary: our top end guys are doing well and we may have some finds in the later rounds. On the downside, most of the rest of the first round picks are struggling. Such is the nature of the new draft classes; picks 7-10 are more like 25th rounders while picks 11-15 are more like 6th-10. John Sickels writes the very good blog located at www.minorleagueball.com. He does profiles on Minor League players, reviews the day’s marquee Minor League games, and generally does a good job highlighting the guys down on the farm. Late this past season he embarked on a project where he has reviewed the performance of EVERY draft pick, by round, from the 2012 draft. This, as you might imagine, is one heck of an effort. In fact, in one of his later posts, he admitted he may not have the sanity to continue this all the way through all 40 rounds of players. In fact, he didn’t; he made it through 17 rounds and last posted on this thread 9/27/12. So I’ve completed his quick-hit analysis/statistical summary for the rest of our picks who debuted this year. Below is a cutting-n-pasting of Sickels’ round-by-round analysis of the Nats players taken. I’ve put in links in the form of the “Round N” at each spot so you could read his original post. The (YY) number is overall draft pick positioning. Lastly, he started this series in mid-August, so I’ve updated the first several playerswriteups from Sickels’ to have season-ending stats, but his blurb is usually still accurate enough. After round 17, I’ve filled in the details in Sickel’s style for the rest of our draftees. (For draft reference, click here for the fantastic Nationals Drafttrack Google XLS, created by Brian Oliver and now maintained by “SpringfieldFan.” Also, for 2012 draftee information, thanks to Sean Hogan‘s 2012 Nats draft pick blog research, which I’ve quoted at various places here. He has the best available summary of each draftee’s information. Round 1: (#16 overall) Lucas Giolito, RHP, Washington Nationals: Threw two innings in the Gulf Coast League on August 14th. [Editors Note: obviously we all know by now that those two innings resulted in Giolito’s blowing the partially torn UCL, and he has subsequently had Tommy John surgery. My thoughts on the pick and the resulting surgery have been published here before]. Round 2: (80) Tony Renda, 2B, Washington Nationals: .264/.341/.295 with 31 walks, 33 strikeouts, 15-for-18 in steals over 295 at-bats for Auburn in the NY-P. Controlling zone well, steady glove, but lack of pop is disappointing. He did improve his average 30 points in the last few weeks of the season, finishing hot. Round 3: (111) Brett Mooneyham, LHP, Washington Nationals: 2.55 ERA with 29/16 K/BB in 42 1/3 innings for Auburn in the NY-P, 36 hits. Just like in college: looks like a pitcher, good arm, but doesn’t dominate the way you think he should. Like Renda, a couple of good late outings improved his peripherals. Round 4: (144) Brandon Miller, OF, Washington Nationals: .292/.354/.549 with four homers, 10 walks, 36 strikeouts in 113 at-bats for Auburn in the NY-P. Small sample, but fits the scouting reports perfectly: he’s got a ton of power, but struggles for contact. Round 5: (174) Spencer Kieboom, C, Washington Nationals: .258/.362/.305 with 19 walks, 24 strikeouts in 128 at-bats for Auburn in the NY-P. Has thrown out 44% of runners, but bat looks doubtful. Round 6: (204) Hayden Jennings, OF, Washington Nationals: .192/.254/.231 with 11 walks, 70 strikeouts in 156 at-bats in the GCL. Has stolen 17 bases in 19 attempts, but his strikeout rate is obscene. Round 7: (234) Robert Benincasa, RHP, Washington Nationals: 3.09 ERA with 32/3 K/BB in 23 1/3 innings for Auburn in the NY-P, 27 hits, 2.00 GO/AO. Slot bonus from college, could move quickly as reliever if healthy, just went on DL [Editor’s note: the DL trip seemed innocuous, a roster manipulation at season’s end]. Round 8: (264) Stephen Perez, SS, Washington Nationals: Below slot bonus for college infielder, awful hitter so far, .222/.252/.364 with four walks, 40 strikeouts in 99 at-bats between GCL and NY-P. Glovework also disappointing. Has good tools but didn’t play up to expectations in college at Miami, and hasn’t in pro ball so far either. Round 9: (294) Derek Self, RHP, Washington Nationals: Below slot college pitcher, solid in pro ball so far, 3.27 ERA with 25/8 K/BB in 33 innings for Auburn in the NY-P, 32 hits, 14 saves. Good fastball/cutter combination. Round 10: (324) Craig Manuel, C, Washington Nationals: College backstop with good defensive and intangible rep, bat questions kept him to a small bonus. So far, hitting .287/.376/.315 with 16 walks, 11 strikeouts in 143 at-bats for Auburn in the NY-P, with 41% of runners caught. If he had any power at all, he’d be a major sleeper. Round 11: (354) Brian Rauh, RHP, Washington Nationals: Slot bonus for college pitcher, 3.99 ERA with 43/26 K/BB in 59 innings for Auburn in the NY-P and Hagerstown in the Low-A South Atlantic League. Held his own in pro ball although component ratios aren’t great. Round 12: (384) Carlos Lopez, 1B, Washington Nationals: Below slot bonus college first baseman, solid slugger at Wake Forest but didn’t repeat success as a pro, .253/.332/.376 with three homers, 20 walks, 50 strikeouts in 170 at-bats for Auburn in the NY-P. Age 22. Round 13: (414) Elliott Waterman, LHP, Washington Nationals: Slot bonus college pitcher from San Francisco, 4.97 ERA with 24/22 K/BB in 25 innings for Auburn in the NY-P, 31 hits. Held back by control issues at this point. Age 21. Round 14: (444) Jordan Poole, OF, Washington Nationals: Another junior college guy, this one from Florida, name was called as a pitcher but he played outfield in pro ball, hit .205/.264/.295 with 10 walks, 58 strikeouts in 132 at-bats between GCL and NY-P. That won’t get it done. Round 15: (474) Brandon Smith, OF, Washington Nationals: California prep didn’t sign, honored committment to Grand Canyon University. Round 16: (504) Ronald Pena, RHP, Washington Nationals: Junior college pitcher from Florida, low 90s stuff, 6-4, 195 build, 12 innings with a 2.92 ERA and a 9/1 K/BB, five hits allowed between GCL and NY-P. Sleeper potential. Round 17: (534) Blake Schwartz, RHP, Washington Nationals: College senior from Oklahoma City University, originally from Minnesota, performed well in pro debut with 3.05 ERA, 41/11 K/BB in 38 innings, 39 hits in the South Atlantic League. Considered a sleeper by some Midwestern scouts due to his command. Round 18: (564) David Fischer, RHP, Washington Nationals: College senior from U-Conn, the lanky right handed hurler (6’5″, 175lb) struggled in his Short-A debut, posting a 4.96 ERA, 31/14 K/BB in 49 innings, 56 hits. Fischer only had a GO/AO ratio of 1.11, so he needs to work on keeping the ball on the ground in 2013. Considered a possible top-10 talent early in the 2012 college season, Fischer’s fastball sits 92-93 on a projectionable frame, but his off-speed pitches need work. Round 19: (594) Brian Lippincott, 1B, Washington Nationals: a College senior from Concordia, this left-handed batting first baseman hit .281/.361/.374 with 16 walks, 29 strikeouts in 139 GCL at-bats. This is decent but far less impressive than Lippincott’s college career, where he hit .494 his senior season to led all Division II batters. He showed some power in college but relatively little in pro-ball; he’ll need to feature more power to stick at first base. Round 20: (624) James Brooks, SS, Washington Nationals: a College senior from Utah hit .273/.345/.354 with 8 walks, 25 strikeouts in 99 GCL at-bats. He was 1-32 in 10 games in Auburn before being dropped down to the Rookie League. Perhaps the most interesting thing about Brooks is his birth place: Melbourne, Australia. No word yet whether he’s under consideration for Australia’s 2013 WBC team. Round 21: (654) Austin Chubb, C, Washington Nationals: College senior from Florida Southern hit .209/.260/.373 with 3 walks, 11 strikeouts in 67 GCL at-bats. He hit left-handers to the tune of .400, but in a catcher-platoon, only catching every third day or so, he struggled to get going in 2013. He only threw out 3 of 12 runners and allowed 2 passed balls in his 10 games behind the plate. He’ll have to improve all around in 2013. Round 22: (684) Will Hudgins, RHP, Washington Nationals: a College senior from Notre Dame (who hails from Richmond, so he has local roots) posted a 2.22 ERA, 31/6 K/BB in 44 2/3 innings, 41 hits split between GCL and AUB. Decent numbers despite being a 22-yr old in rookie ball, he has some promise as he fills out and moves forward. Perfect Game only has him with a mid-80s fastball but “with life;” I’m hoping that’s an old reading. Round 23: (714) Casey Selsor, OF/LHP, Washington Nationals: this College Senior from UT-San Antonio was drafted ostensibly as an outfielder but threw 41 innings in rookie-ball while also getting a handful of at-bats/games in the field. He did neither relatively well; posting a 6.10 ERA, 34/15 k/bb in those 41 innings giving up 50 hits and seven home runs. While playing the out-field he was 1-6 in 3 games, hardly a judge-worthy sample size. The Nats clearly like this guy, having drafted him in 2008 out of high-school, so count on him sticking around at least a couple years. On the mound, he features as an undersized lefty (he’s only 5’10”) who throws upper 80s but with excellent secondary stuff. Round 24: (744) Kevin Dicharry, RHP, Washington Nationals: College Senior from University of Texas missed most of his college career with shoulder issues (tendinitis) after an excellent freshman year. His pro debut looked very promising; 2.84 ERA, 22/4 K/BB in 25 1/3 innings, 19 hits, zero homers allowed. Dicharry was highly regarded nationally graduating high school (a 2nd team Rawlings All-American and a marquee part of Texas’ recruiting class) and this pick represents a great value pick for the Nats if Dicharry regains some of his past form. He reportedly is showing a low 90s fastball, a tight curve and a good change this year, to go with his excellent control (nearly a 6-1 k/bb ratio). A sleeper prospect if he stays healthy. Round 25: (774) Freddy Avis, RHP, Washington Nationals: California prep didn’t sign, honored commitment to Stanford. Round 26: (804) Skye Bolt, RHP, Washington Nationals: Georgia prep didn’t sign, honored commitment to UNC. Round 27: (834) Cody Poteet, RHP, Washington Nationals: California prep didn’t sign, honored commitment to UCLA. Round 28: (864) Hunter Bailey, SS, Washington Nationals: College senior from Oklahoma State hit .247/.345/.329 with 8 walks, 12 strikeouts in 73 GCL at-bats. He clearly features as a low-power middle infielder glove and may struggle to stand out in the system. Round 29: (894) Leonard Hollins, RHP, Washington Nationals: A JuCo 2-year graduate from Chipola college threw 9 no-hit innings in the GCL and then was jumped to low-A, where he posted a 4.50 ERA in 18 innings, 8/7 K/BB ratio, giving up 18 hits. He’s a submarining right-handed reliever who had a tendency to pitch either a perfect 1-2-3 inning or give up a slew of hits. He’s tough to get the ball in the air on though; a 3.50 GO/AO ratio in Hagerstown and zero homers given up in 27 IP in his pro debut across both levels. He could be an intriguing, difficult-to-scout/hard to quantify reliever for the team moving forward. A sleeper reliever prospect. Round 30: (924) Robert Orlan, LHP, Washington Nationals: A junior draftee out of UNC, Orlan suffered an elbow injury late in the college season and was immediately placed on the 60-day DL by the team. No bonus information is given for the player, who likely signed with the team knowing that a year’s recovery from Tommy John would have cost him his entire senior year of college too. He profiled as a top-15 round talent, a lefty with decent velocity (upper 80s coming out of HS, presumably more now) and a decent variety of pitches. Another value pick by the Nats, who could get a later-round steal if Orlan regains some of his promise after injury recovery. Round 31: (954) Michael Boyden, RHP, Washington Nationals: This college senior out of University of Maryland quickly was promoted out of the GCL and posted a 1.44 ERA in 25 innings of short-A. His control was pretty bad though: 22/17 K/BB ratio in those 25 innings. In college he reportedly showed 90-92 with flashes to 94, but dropped because of his size and control issues. This local product (he grew up in La Plata, played a year at GW and finished at Maryland) likely gets lucky to be drafted by his local team, and we’ll see if his wildness causes some regression on these numbers in the future. Round 32: (984) Michael Mudron, LHP, Washington Nationals: College senior from Cal State San Bernadino posted a 3.75ERA in 24 innings in the GCL, with a 27/8 K/BB ratio, 16 hits. A decent K/bb ratio, decent numbers for Mudron (who is incorrectly listed on milb.com as a right-handed pitcher). I cannot find any scouting information, but assume that he profiles as a lefty match up guy (though his 2012 splits showed little lefty-lefty matchup capability). Round 33: (1014) Mike McQuillan, 2B, Washington Nationals: College senior from Iowa hit .268/.362/.430 in 149 ABs for Auburn after being promoted out of the GCL. 21 walks and 27 Ks in those 149 Abs. He features as a classic undersize 2nd baseman with little pop, but if his OBP stays above .350 he should continue to rise in the system. Round 34: Jake Jeffries, 2B: California Prep did not sign, honored commitment to Cal St. Fullerton. Round 35: Corey Bafidis, LHP: Texas Weslylan junior opted to return for his senior season. Round 36: Max Ungar, C: Maryland Prep did not sign, honored commitment to Denison. Round 37: Tyler Watson, LHP: Texas Prep did not sign, honored commitment to Kansas. Round 38: Jarred Messer, RHP: Mallone College (OH) junior opted to return for his senior season. Round 39: Mitchell Williams, C: Georga Prep did not sign, honored commitment to the Marion Institute. Round 40: Ricky Gutierrez, CF: Florida Prep did not sign, honored his football commitment to U-Conn. There you have it; your 2012 draft class. So far, there seems like there’s some definite sleeper potential in the lower rounds and some players who played above their draft position. I can’t wait to see how the likes of arms Pena, Schwartz, Hudgins, Dicharry and eventually Orlan pan out.